Never before in its history has CEDE put so much emphasis on the importance of integration between the worlds of business and science in the dental industry. Close to 10,000 participants from 47 countries could try out products offered by 200 exhibitors and attended more than 200 educational events. 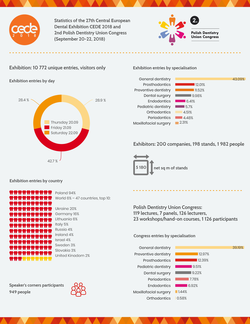 On Saturday 22 September this year, the 27th Central European Dental Exhibition (CEDE) came to an end in Poznań. Those who came to the capital of Wielkopolska (Polonia Major) witnessed the next stage in the metamorphosis of this event – from a conventional exhibition into a project that allows visitors to familiarise themselves with the latest technology and acquire world class knowledge. - CEDE has been a breath of fresh air for the industry. We believe that the main value to be gained from participating in such an event is knowledge – both knowledge of products and knowledge of treatment methods, although these two areas obviously overlap. We are delighted that more and more exhibitors involved in educational projects are of a similar opinion. The number of participants interested in such projects shows that we have chosen the right path - points out Marek Wiktorowskifrom the Exactus company, the organiser of CEDE. Nearly 10,000 people attended this year’s edition of CEDE (counting as unique, individual entries through the gates) from 47 countries. After Poles the largest groups by nationality were as follows: Ukrainians, Germans, Pakistanis, Iraqis, Lithuanians, Italians and Nigerians. A total of 201 exhibitors (198 stands) presented their products at the exhibition. The stands occupied an area 5,180 m2 in size. It is worth pointing out that more than 1000 people took advantage of CEDE's brand new feature – its educational forums: Dentistry 3.0, Dental Club and Business Dental Forum. Several dozen producers and distributors participated in this project. While still on the subject of the exhibition itself, we ought to mention the 52 products which competed in the online poll Stars of CEDE 2018. The winners eventually chosen by the voters were: the Emerald Planmeca intraoral scanner in the Equipment category (Kol-Dental), Collagen Membrane in the Materials category (DentalHolding), the SEYSSO Gold Black sonic toothbrush in the Prophylaxis category (Shop-dent) and the Inteware software package in the Education/IT category (DentalHolding). This year’s exhibition saw the launch of a new social awareness campaign called “Open your Mouth and Say No to Cancer”. Several hundred residents of Poznań and the surrounding took advantage of free dental examinations. Several dozens of them were referred for a further diagnosis. The project was supervised by Professor Marcin Kozakiewicz (Medical University of Łódź), and was carried out with the participation of Poznań City Office, the ”A Smile for Life” Foundation, and PTSS Poznań. A detailed report on the results of these examinations will be published in the near future. The number of participants attending the 2nd Polish Dentistry Union Congress, CEDE’s sister event, can be regarded as an undoubted success. Just under 1200 people came to the lectures and workshops held in pavilions 15 and 7. The Congress is thus on its way to becoming the biggest educational event in the dental field. The lecture halls were packed to the rafters for the following: the III National Congress of Dental Hygienists and Assistants (300 participants), a satellite symposium organised by Chema-Elektromet (270 participants), the "Let's treat milk teeth* session (243) and the lecture “Determining Vertical Dimension of Occlusion in Prosthetic Treatment” by Dr. Jolanta Kostrzewa-Janicka (218). Nearly 200 people also attended sessions on the following topics: rational antibiotic therapy (the resulting recommendations will shortly be available in script form) as well as “Treatment for pregnant woman”. In total more than 100 speakers took part in the project, including three from ERO-FDI: Joseph Shapira, Hande Şar Sancakli, and Alex Mersel. - The sheer number of Congress participants this year is proof that we chose our subjects well. We had expected our topics to appeal primarily to non-specialist practising dentists – and such was indeed the case. Many of them were seeking reliable treatment algorithms, as well as step-by-step guidance in how to perform specific procedures, in both the medical and legal spheres. I believe that we managed to provide them with the help they needed. We were pleased with the number of questions the lecturers were asked as well as with every interaction following the lectures, thanks to them we know in which direction to take the project ­- explains Professor Marzena Dominiak, chairwomanof the National Scientific Council and President of the Polish Dental Association. While on the topic of education, mention should also be made of the winners of the “Science Head Rush – Innovations in Science” session. The winner in the student category was Marcin Olek (Medical University of Silesia) for his work “Preparing on a screen - i.e. thermographic temperature management in the pulp chamber during tooth preparation”. he best doctoral work presented before the jury was a research project conducted by Dr. Oskar Armata, MD, PhD (Medical University of Łódź) entitled “The use of CBCT cross sections in the diagnosis of root fractures”. Their prizes will be attractive internships in the Be Active Dentist training programme and at the Dentalnarco Dental Clinic in Milan specialising in aesthetic dentistry, run by world renowned specialists Danilo Di Stefano and Gian Battista Greco (the Acteon prize). It is no secret that the future of the project, especially in terms of its value as an educational event, is in the opinion of CEDE Organisers, closely tied to that of the recently restructured Polish Dental Association (PTS). PTS greatly values its participation in CEDE. The Association’s stand located in the centre of the passageway was a hive of activity and a place of important meetings where the seeds of many interesting future projects were sown. Prof. Marzena Dominiak together with her enthusiastic team set themselves the mission of achieving scientific integration, and this mission will be the basis of subsequent editions of CEDE and the Polish Dentistry Union Congress. - An exhibition with a tradition stretching back 27-years and a strong scientific association undoubtedly form a team with great potential. Today it is easier to analyse needs and create industry-specific solutions. We look to the future with optimism – adds Marek Wiktorowski.